Looking for a simple, delicious and healthy compliment to your summer barbecue? Best made with garden fresh, ripe ingredients, this gluten-free salad is sure to impress your taste buds. 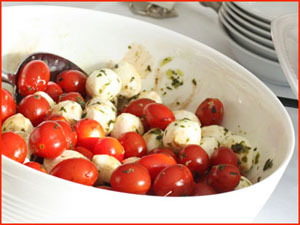 Bocconcini, literally meaning "little mouthfuls" in Italian, are bite-size balls of fresh mozzarella. Pair them with sun-ripened cherry tomatoes and you have one of the most simple, delicious, and refreshing salads of the summer. Combine the lemon, garlic, basil, parmesan, olive oil, salt and pepper. Add the mozarella and tomatoes and gently toss. One of the healthiest cheeses you can eat is part-skim mozzarella. One ounce of mozzarella cheese is 72 calories, less than 1 gram of carbohydrate, and 6 grams of protein. Fat content total is 4.51 grams. This cheese type gives us both calcium, and phosphorus, which are both bone building nutrients. Phosphorus helps the calcium in our bodies to process better. Calcium not only helps to build up bone mass, but it also is instrumental in helping proper blood clotting formation along with proper functioning of the nerves and muscles. Alos, within a serving of this cheese type is iodine, another extremely important nutrient. Iodine is supportive of thyroid functioning, and plays a role in the health of our teeth, hair, and skin. Iodine also kills toxins in the body as well as helping the body to properly process fats. Vitamin A is a part of bocconcini as well. Vitamin A helps in the fighting off of viruses since it does build immunity, and works to help the health of the eyes. Omega-3 fatty acids in mozzarella low-fat cheese total 38.4 milligrams in a serving size. Omega-3's are supportive to many different body functions, helping keep the skin normal and balanced, and helping prevent heart disease. Furthermore, selenium is also a part of low-fat mozzarella cheese at 4.08 micrograms. Selenium is a type of trace mineral which helps to combat inflammation and works to process the healthy antioxidants in our body. It is not so hard to make this cheese a part of your low-fat diet plan. You can put it on a sandwich as a topping, or into a salad.